Gold prices inched up during early Asian hours today set to rise for the second straight week on safe-haven demand for the metal ahead of the G20 summit next week where the leaders of the United States and China are set to discuss their trade dispute. Traders now eagerly await updates on the G20 summit as headlines surrounding the summit might cause high volatility giving opportunity to make some short term gains. However, Chinese growth concerns combined with positive US treasury yields might limit the upside potential for the precious metal going forward. 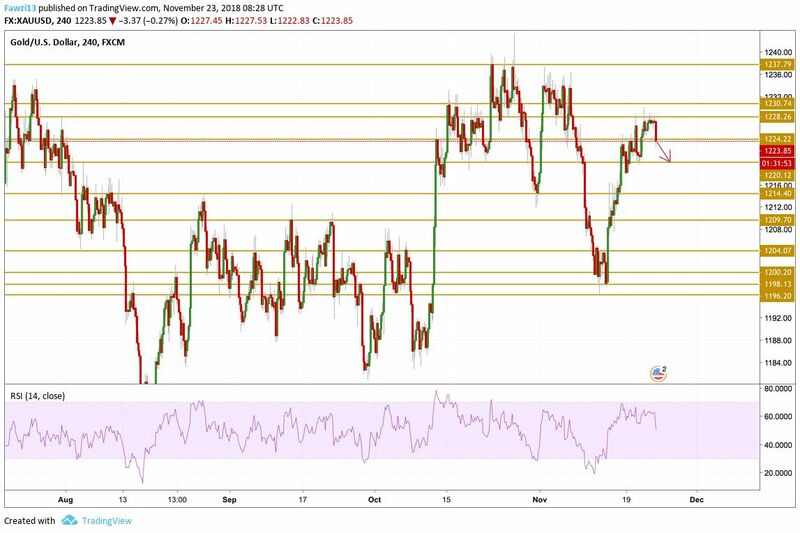 Gold found buyers during the early morning session once again but it also failed to break above the $1228.26 for a third time now causing the price to settle around the $1224 level after loosing momentum. Today we will be focusing on the crucial and key technical support level at $1220.12.